My husband and I have been blessed with two daughters, ages 5 and 3. 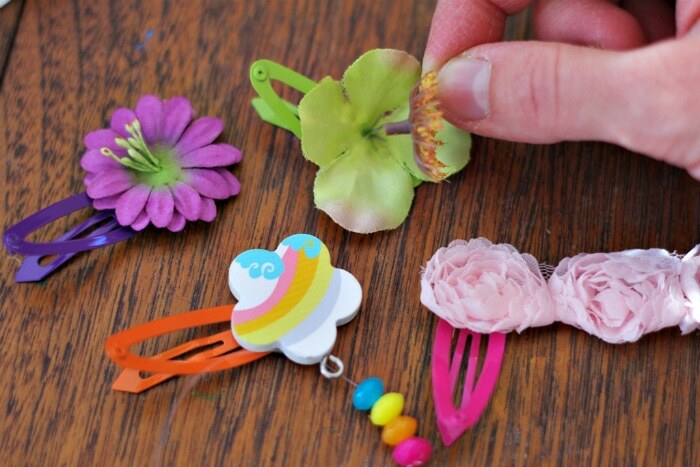 I learned quickly that with a little girl comes pretty hair decorations for girls. My oldest likes to color coordinate her hair accessories with every outfit. My youngest likes to pick her favorite headband and wear it with everything – even her mismatched pajamas. No matter the approach, I love to see the joy they have in pursuing something pretty in their hair. 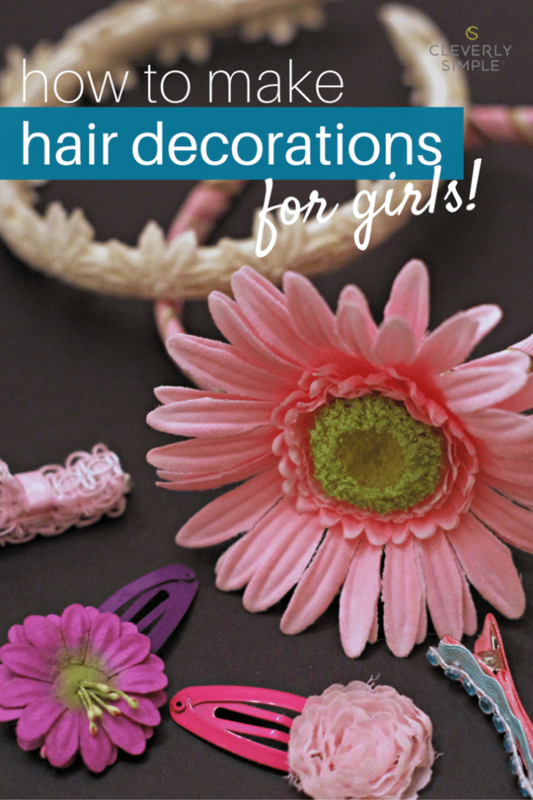 Today, I’m going to show you how to make homemade girly hair decorations in three ways – bow snap clips, ribbon alligator clips and flower headbands. Most everything I am using I had on hand. I had some dried flowers leftover from various projects, extra ribbon pieces and beads. I purchased a 98 cent set of headbands from the thrift store and a package of plain hair clips. 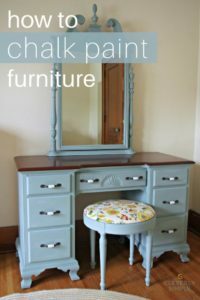 The best part of this project is that anyone can do it! 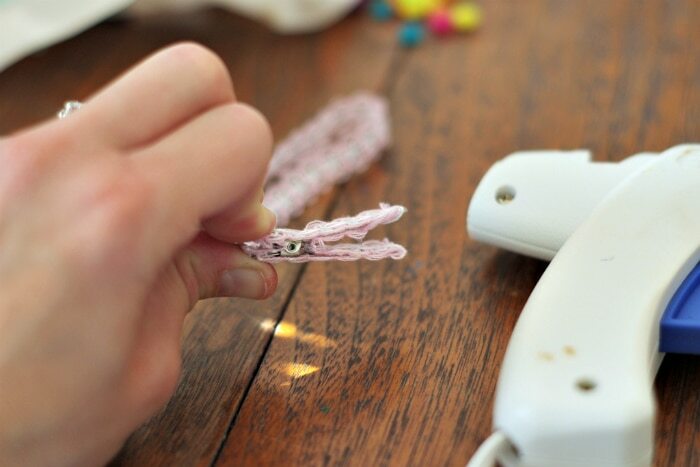 There is no need for a sewing machine and there is no wrong way to create hair accessories! 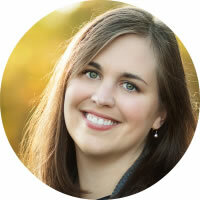 My goal in this post is simply to inspire you to come up with more ideas on your own! 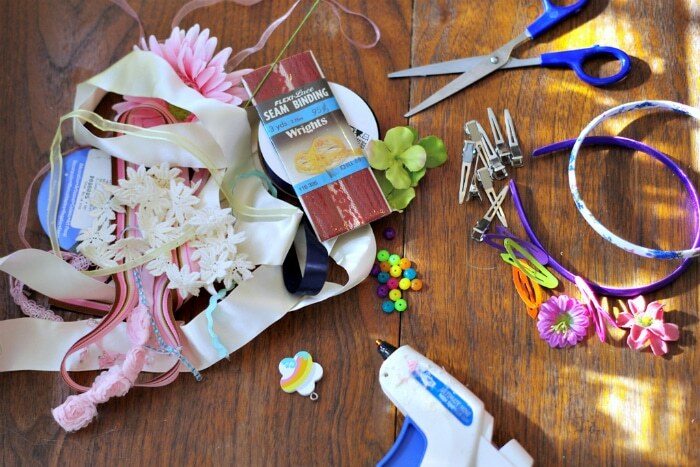 Are you ready to make some homemade girl hair things with me? Here is a picture of what I am using today. I grabbed some loose dried flowers I had in storage(some leftover from our wedding 10 years ago! ), ribbon scraps, beads and even lacy seam binding tape that I never used. All of it can decorate the hardware. I also have a good pair of scissors and a hot glue gun. Let’s start with creating our snap clips. So easy! 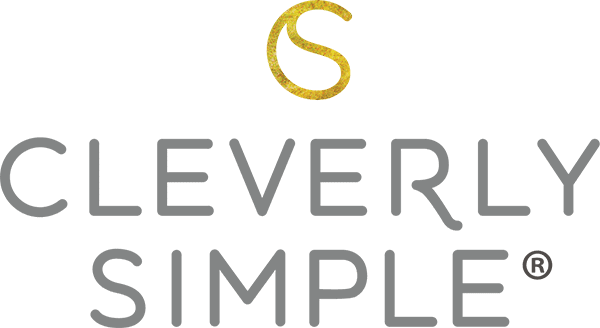 Simply glue on your pretty dried flowers or ribbons onto the wider top side end (where the clip does NOT come down when snapped). 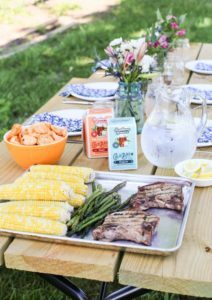 If using flowers, be sure to cut off the stems first. Here, I’m showing that I need to trim off that little nub in the center flower before gluing it down. This will create a nice flat surface. I tried an experiment with the orange clip. My eldest had this sweet wooden piece that had a small hook on the end. I glued it on and then used fishing line to attach four colorful beads as a string behind. I think it’s my favorite! That’s what I love about this. You can create as you go! Now on to the alligator clips. I purchased a 10 ct. bag of naked clips from Hobby Lobby for less than two dollars. 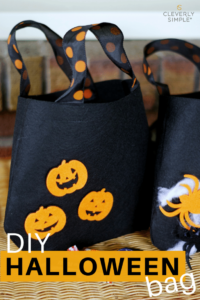 Once you see how easy these are to transform, you will never want to buy finished clips again! The process is simple. 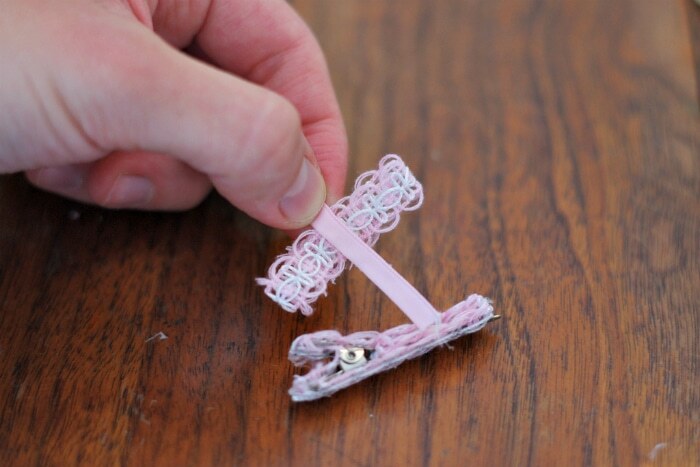 Get a hold of 3/8 – 1/2 inch ribbon. 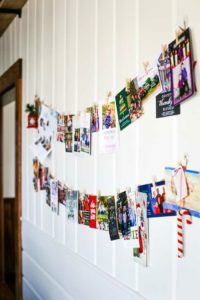 First, wrap the ribbon (starting at the top or bottom) like a snake until you get to the other side, gluing as you go. The entire clip should be covered in ribbon. Next, using the same color or a different color ribbon, glue together a circle that is about the same length of the clip itself. 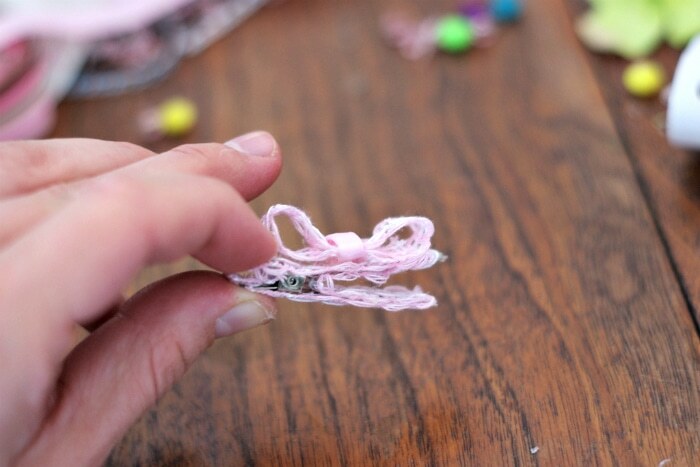 Pinch the circle in the middle and wrap another smaller ribbon down the center to create what looks like a bow. 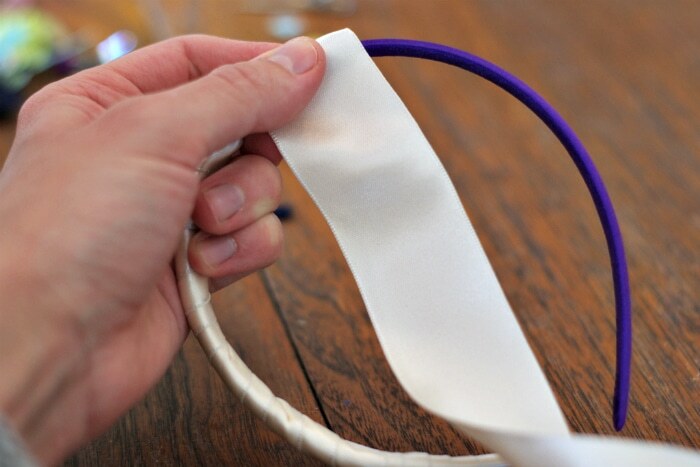 You can fold the ribbon lengthwise to make it smaller. 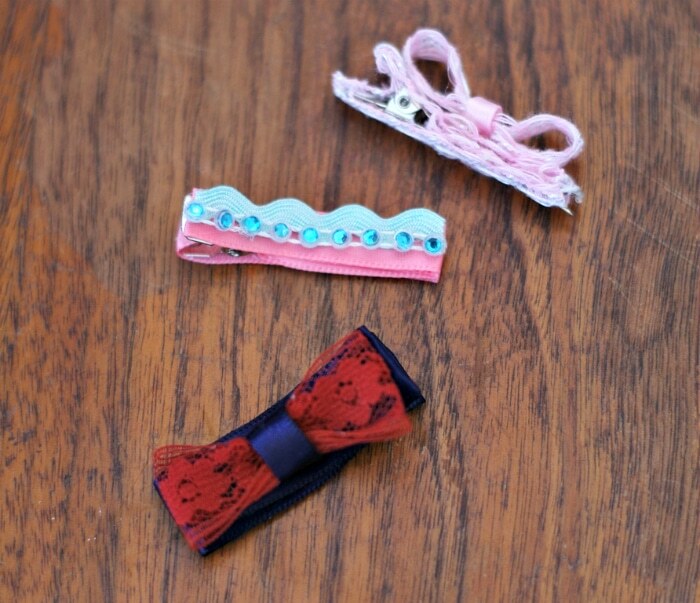 Finally, glue the faux bow to the top of the ribbon covered clip. Let’s finish with the headbands! 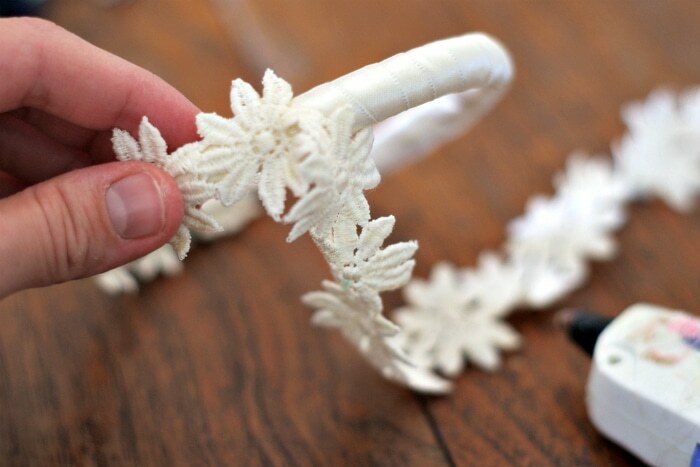 You can cover any old or stale headband and make it new. Glue one end of 1 1/2 – 2 inch ribbon onto the end of your headband and while pulling tight, wrap the ribbon around the length of the headband. Tuck any uneven parts underneath as you wrap. Make sure to pull tight! When you get to the other side, cut off the excess and glue down the end. Now you have a nice base to add decoration. Here, I’m using some wider floral lace ribbon to layer on top. You could also use dried flowers, cascading beads, jewels….whatever you think is pretty! 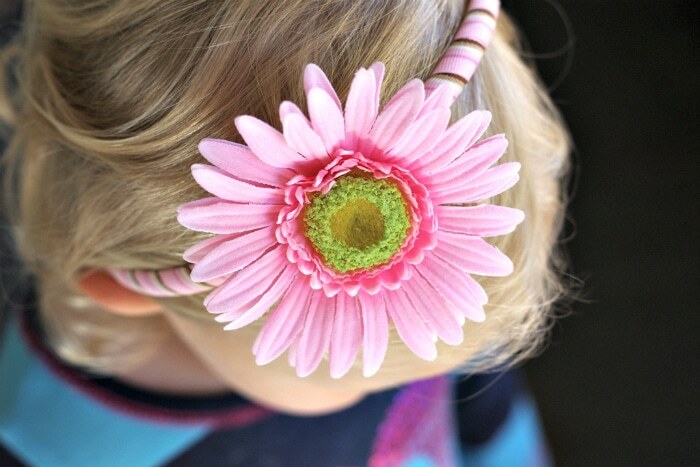 My 3 year old adores big flowers in her hair, so I attached a pretend pink gerber daisy and literally made her day! I shared with her that the pink flower came from our wedding reception, but she insisted that it was given to me by a fairy 🙂 She wore that headband the remainder of the day and yes, even with her pajamas. There you have it! 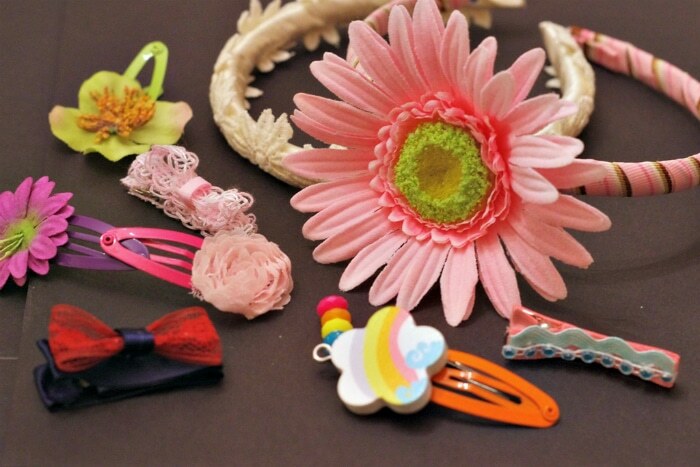 In about an hour, I made 9 new hair accessories for my girls using recycled decorations and some inexpensive clips and bands. With Christmas on the way, it is the perfect time to create beautiful hair accessories for beautiful girls. These also make a great gift, a pretty top off to a new dress or a fun way to spend the afternoon.